F. Marion Crawford, American novelist ("classic weird and fantastic stories")(1854-1909). New York: Douglas Taylor, Printer, corner Fulton and Nassau Streets, 1881. 27pp., 8vo, original printed front wrap, back wrap mainly detached, signs of having been bound up (wear at spine, page partly detached), some staining, contents fair. INSCRIBED BY AUTHOR, "H. Norman Esq. with kindest regards of F. Marion Crawford | Aug. 11 | 1881 |" [Henry Norman, "English journalist and Liberal politician "]. Minor correction in blue crayon (hand unknown), omission of several words and phrases on last page.. This was published before his first published novel. A financial tract (currency etc). No copy listed on COPAC, six copies listed (USA) on WorldCat. 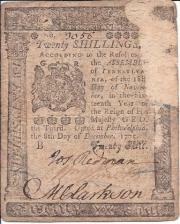 Philadelphia twenty-shilling Bill of Credit, from the period of the American War of Independence, signed by Matthew Clarkson, Joseph Redman and William Smith. Matthew Clarkson (1733-1800), Mayor of Philadelphia, 1792-1796; Joseph Redman; William Smith. No. 3056. Printed by Hall and Sellers. 1775. Printed on both sides of a piece of 7 x 9 cm paper. Worn and aged, with damage along edges on both sides, affecting a few words of text, but not the signatures. Both sides with ornate decorative borders. On one side with printing details and decorative pattern of foliage; the other with the number filled in in manuscript, engraving of Royal Crest, and printed declaration, dated 'in the sixteenth Year of the Reign of His Majesty GEO. the Third. Dated at Philadelphia, the 8th Day of December, 1775. Signed at foot 'Jos Redman', 'Wm. 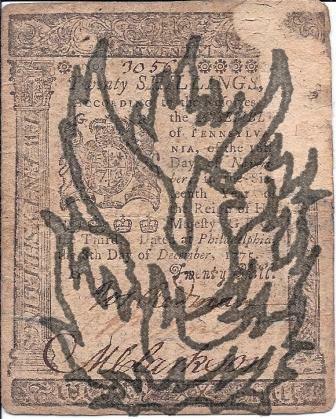 Smith' and 'M Clarkson' (the second signature faded). Abraham Whitehead, campaigner against child labour etc. London: Whittaker & Co., Ave Maria Lane, and all Booksellers, 1843 (Holmfirth: Printed by Joseph Crosland). 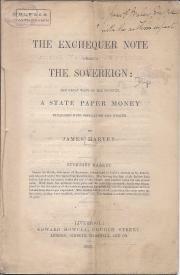 Continuation of title: "... Also, shewing how and quantity of Money may be made upon entirely new principles, so as to form a safe and useful Currency, and how the National Debt may be rapidly and honestly liquidated, at the rate of Compound Interest, without imposing fresh Burdens on the People." 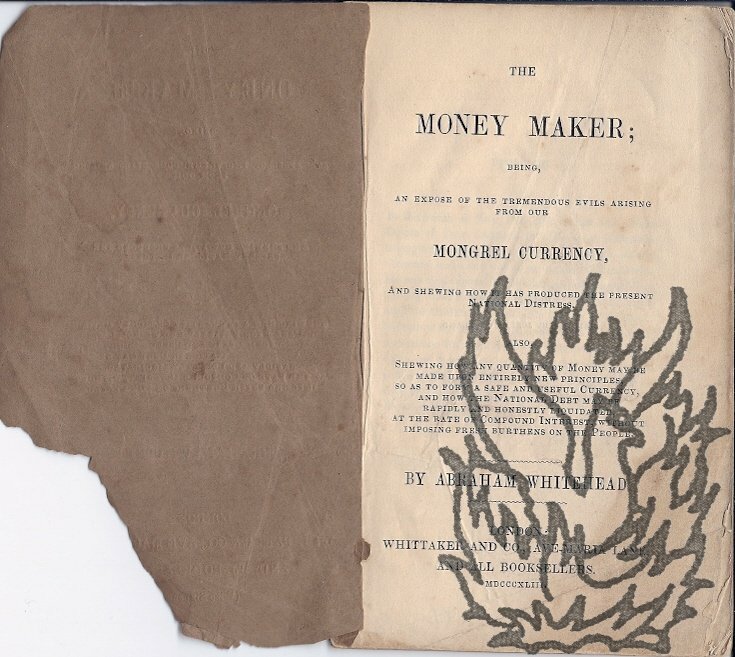 Booklet, 42pp., 12mo, brown printed paper wraps, corner of front missing (loss of word and 5 or 6 letters from imprint), some staining, chipping and tears of covers , mainly intact, bottom corner of pages turned, contents mainly good condition. 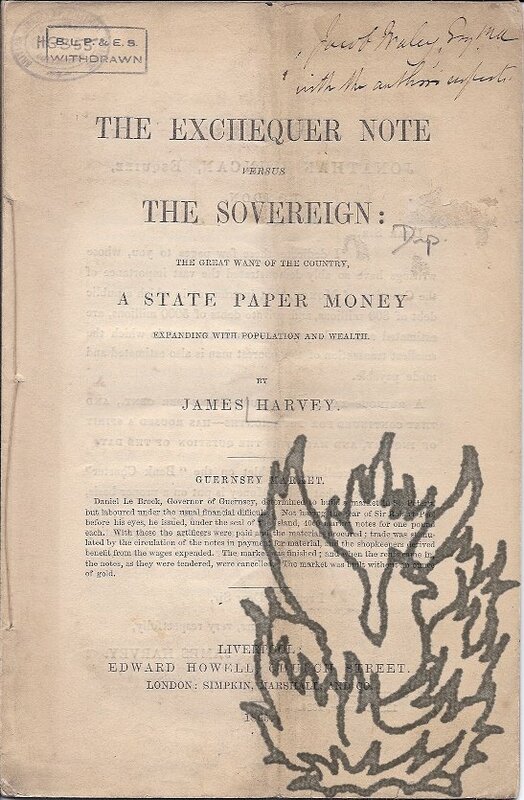 [Pamphlet; inscribed by author] The Exchequer Note versus the Sovereign: The Great Want of the Country, A State Paper Money expanding with population and wealth. Liverpool: Edward Howell . . . London . . . , 1865. 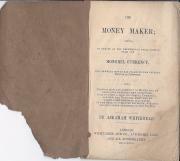 Printed pamphlet, 24pp., 8vo,sewn as issued, wraps grubby, contents good. Inscribed Jacob Waley, [?] with the author's respects. Jacob Waley was the first president of the Anglo-Jewish Association and Professor of Political Economy at University College London.